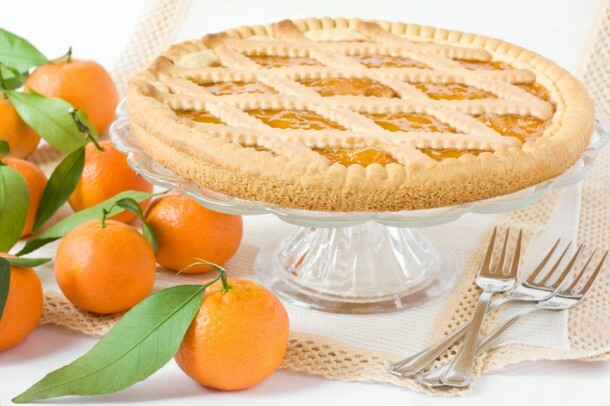 This is an easy recipe for a tangy clementine marmalade tart (a very popular dessert in Italy and known as a ‘Crostata’) that looks tempting and costs very little to make. Of course it’s even easier and just as good if you use ready made pastry. First of all prepare the pastry. Mix the flour & sugar together with a fork. Make a well in the centre and add the butter (cut into pieces & at room temperature). Rub the butter into the flour until the mixture resembles fine breadcrumbs, add the lemon zest. Stir in the egg & the vanilla extract until the dough becomes more compact and does not crumble. Make a ball and cover it with cling film. Leave it to stand in the fridge for half an hour. Roll out 3/4 of the dough (to a height of 4-5 mm) and line the tin, previously lined with baking paper. Spread the clementine marmalade onto the pastry. Cut some 1.5 – 2 cm wide strips with the leftover pastry to decorate the top of the tart being careful to press them down gently. Bake for 35 minutes in a preheated oven (180 degrees). Cut the tart into wedges and serve either warm or cold with a spoonful of Greek yogurt, creme fraiche or ice cream. You may also like our recipe for Apple Pie with Bergamot Marmalade.